Time flies when life keeps you busy. I'm ashamed to say that I discovered my turning twenty blanket in the cedar chest where it has been hiding for two years and it still does not have the binding on it. 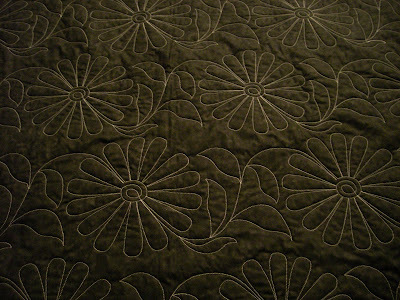 It is beautifully quilted by Rachel with an all over daisy design she had. I can't believe its been just sitting there 99% completed. I didn't finish it. I just did not add the binding. Actually there were two quilts like this. However, two years ago, I hated binding. 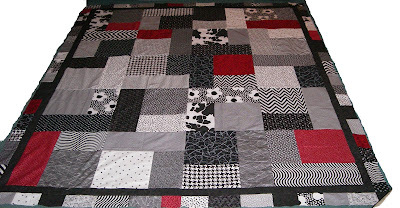 So, my goal for this weekend is to add the binding to my Oopsey Daisy Turning Twenty Quilt and finish it! I love black red and white. 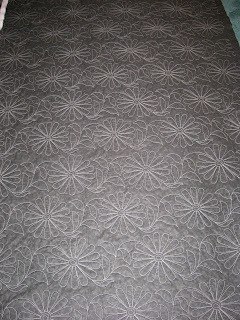 Here's the quilt when last completed and the Daisy quilting. This is so cute! I can't believe that you haven't finished it. Get it done girl! I haven't been quilting long enough, therefore have very few projects left over, other than fabric because I can't add or divide which is a dilemna. That's why I must resort to the stash busting for now. It's hard to do. I too love black and white, with a colour to pop it they always look great.